The Perfect Stag or Hen Party ideas! 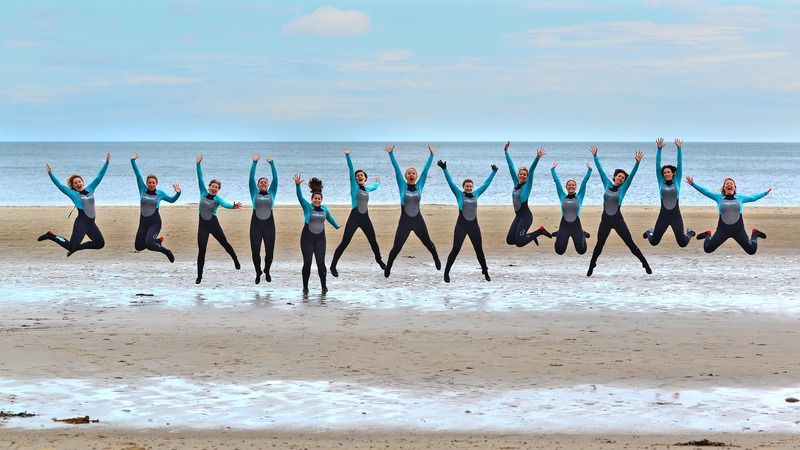 Why choose Stag and Hen Surf Parties in Scarborough? Dexter’s Surf Shop is here to help you make the most of your Stag or Hen do! Events like these are a fantastic opportunity to get out into the water. If you want to humiliate the stag or hen, we are more than happy to help you achieve that. In fact, our only goal is to make you laugh, keep you safe and offer you an unforgettable experience. We can handle groups of up to 40 people and with rates starting at only £20 per person, this is one of the best value activity packages in the area which can be tailored to your needs. If the experience isn’t enough – we even offer souvenirs to ensure that you never forget your time with us here at Dexter’s. We can offer you video footage filmed on our GoPro Karma drone, so the embarrassing moments will be caught from every angle, and no-one will miss your wipeout! Activities in the water are hungry work but don’t worry, we’ve got you covered! We can cater for you as we own the Waves Café next door! Dexters are proud to be the only accredited Surfing England surf academy on the East Coast, so you can be assured that when you’re in the water you are in safe hands the whole time. You can choose any of our activities or lessons either alone or as a custom option package. If you are booking a custom package drop us a line before booking. Scarborough has some of the best seas and beaches, so why not try surfing while you’re here? Whatever the ability level of your group our instructors will find a way to keep everyone happy. Our packages include all the required equipment, so all you need to bring along is yourself. Get ready to be knocked off your feet a few times by some of the best waves in the country! If surfing isn’t your thing, why not try paddleboarding? Most of our sessions take place on Scarborough’s North Bay: one of only a few blue flag beaches in Europe. This activity offers spectacular scenery and a chilled out view of the unique Yorkshire coast. Previous experience isn’t necessary; we will get you on your feet in no time at all. For something a little different, our Super SUP is paddleboarding taken to the extreme! For a more laid back stag or hen, kayaking may well be the perfect activity for you. Just strap yourself into a one-man kayak and tour Scarborough’s world famous Jurassic coastline. A nautical adventure around the reefs and coves is the perfect way to relax, while rougher seas offer a little more excitement for the thrill-seekers out there. XL Fun! Why paddle alone when you can have a mad laugh with up to 9 friends on one giant paddle board? With the Fly Air XL – Dexter’s has taken it to the next level with this activity! Whether you take it for one hour or two – you’ll have XL FUN!! If there’s surf your instructor will take you for a wave riding session or if is flat we’ll take you for a paddle around the bay! But we have saved the best ’til last! At the end of every session, we let you finish with a game of paddle board boxing! Yes, that’s right! We give you XL Boxing gloves and let you battle to the last man standing! So, what are you waiting for? Book now for XL FUN! You’ll need a minimum of 5 to take advantage of the experience. If you fancy mixing it up what not do a bit of everything? Just let us know the size of your group and what you want out of your session and we can get started on putting together your perfect package. Every session varies. If let us know what you would like to get out of your session when booking, we will create a lesson plan tailored to your group and forward it on to you before the date.